"It's the world’s most successful peace keeping mission - which hardly anyone’s heard of!” So says one of the many New Zealand Defence Force personnel interviewed for Sinai Journal: 30 Years of Kiwis serving with the Multinational Force and Observers. 2012 marked the thirtieth year of New Zealand’s significant contribution to the successful, if not widely known, Multinational Force and Observer (MFO) peace keeping mission in the Sinai, set up in 1982 to monitor the Treaty of Peace between Egypt and Israel. Working with 11 other countries to preserve a cold peace between two once warring nations, New Zealanders have distinguished themselves at the MFO with their sense of humor and can-do attitude. Sinai Journal documents the adventures of around eighty personnel who have served at the MFO since 1982 through personal anecdotes, essays and some wonderful photos. Contributions of note include those from the two kiwi Force Commanders; Don McIver and Warren Whiting; as well as colourful characters such as former MP and current Carterton Mayor, Ron Mark. This book is a fascinating social history that celebrates both the thirty year milestone and recognises New Zealand’s long standing, unique, contribution to peace in an unpredictable and volatile part of the world. 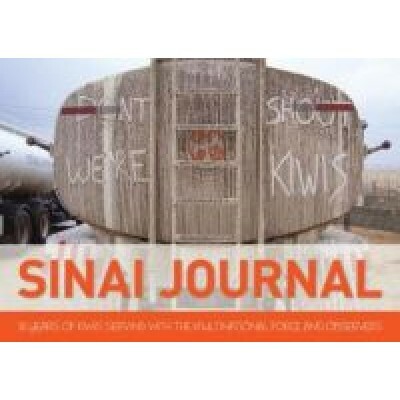 "Sometimes humorous, sometimes irreverent, sometimes sad, the stories in the Sinai Journal capture something of the lives of ordinary New Zealanders doing an extraordinary job in difficult circumstances". Dr Peter Greener, NZDF Command and Staff College. "The NZDF and New Zealanders generally should be proud of the contribution this small band of Kiwis has made to the MFO and to the region, continuing a legacy started by the New Zealand Mounted Rifles in World War 1. Major General Warren Whiting, current MFO Force Commander.